The problem was this: removing duplicate lines in document of company listings. In this particular case, it was 10,000 companies, so doing it manually was not an option. In each listing, there was a company name and address. In some, the first line of the listing was duplicated on the second line, but not all listings had this problem. The challenge was to use GREP to determine which were the problem listings, fix them, but leave the other listings as they were. If I were to go by the book, and didn’t know about GREP before it became part of InDesign, I probably would’ve thrown my hands up and said it couldn’t be done. However, once again, testing something out “just to see” if it would work paid off surprisingly well. When I do GREP searches, I try to frame in my mind the “idea” of the search as clearly as possible. What is it I’m looking for, exactly? In this case, I was looking for a line of text that is followed by another line made up of exactly the same text. Since using literal text is out of the question (each of the 10,000 listings is different), I needed a way to refer back to one part of the search criteria. This “backreference” is, in InDesign, typically only done in the “change to” part of the search, using the “Found Text” metacharacters ($0, $1, $2, and so on). However, those metacharacters don’t appear in the special characters for search menu at the end of the Find what field, nor do they work if you just type them in. But I remembered that in BBEdit, you can do backreferences within a search. For instance, to look for the common duplicate word typo “the the,” you can search for (?‹=\1 )(the), which uses Positive Lookbehind to search for a subexpression consisting of the word “the,” but only if it is preceded by that same word and a space. In BBEdit, the \1 metacharacter is the equivalent of InDesign’s $1 metacharacter for “Found Text 1,” and while that BBEdit convention would not be honored in the Change to field, I decided to give it a shot in the Find what field…and, sure enough, it works! This is completely undocumented GREP support that is very important. Without it, this text cleanup task would be impossible. So…to extend this out to solve the duplicate line problem, I needed to define a line (any string of text followed by a return) as a subexpression (by enclosing it in parentheses), then use a backreference to define a duplicate of that same line, using BBEdit’s “found text 1″ metacharacter (\1) instead of InDesign’s ($1). (\1) refers back to whatever text was matched by (.+) above. In the Change to field, I only want to put back one of these two instances. However, I’ve created two subexpressions. The first is (.+), which InDesign would consider Found Text 1 ($1), and the second is the backreference (\1), which InDesign would consider Found Text 2 ($2). In this instance, it doesn’t really matter which of the two I put back, since they’re both the same, so I opted to put back the first one. To do that, all I needed to do was put $1 in the Change to field. In my opinion, as a GREP geek, this is a huge hidden functionality discovery that opens up even more possibilities for an already great InDesign feature. The screen shot below shows this in InDesign’s Find/Change dialog, along with what it finds on the page. Good to see you back posting Yes GREP is an incalculable mystery and it’s probably one of the best features introduced to InDesign. The tip is magnificen, as you say, it’s completely undocumented. I have to admit, I didn’t know about the trick that is posted, it is truly wonderful and I’ll never forget it. 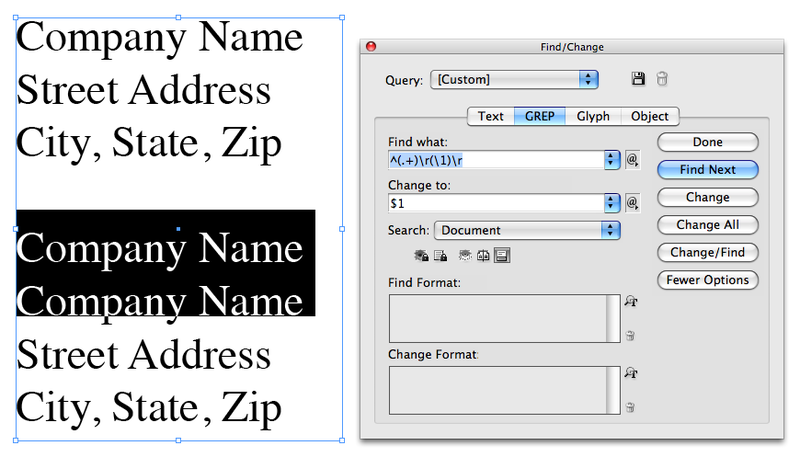 Interesting… I love using GREP in InDesign and think that a useful InDesign feature would be the ability to run multiple GREP presets on a given document to automate more complex FIND/CHANGE or GREP searches. Meanwhile, as an Apple/Java script newbie, I was wondering if anyone knew how to accomplish this task and even provide a sample script to run multiple GREP presets on a given document in InDesign. The any character metacharacter (.) will also find spaces at the end of a line. It finds any kind of character, except a hard return. However, your post brings up a good point. If the first line in this example contains just the company name, but the second line contains the company name followed by a space, this GREP query will not consider it an exact match, so it will be passed over. However, I was just trying to get across how this bit of hidden magic can be used. Every GREP cleanup task will have its own unique obstacles to overcome. Just leave the Change to field blank to remove all of those spaces. Hi Michael, apologies if it appeared I was taking away from the excellent tip. However, when I tested it I discovered it wasn’t working because there were spaces, so just thought I’d point it out for others using the GREP and not getting matches. It is a fantastic tip, and I’m going to have to find me some work that requires some GREPing, as it’s fantastic stuff to know. I urge anyone to learn it and use it and be comfortable with it. If the original post didn’t wet your lips then I don’t know what will. Another great GREP tip. Thank You! query_1 et query_2 sont les noms de l’expression régulière enregistrée dans le paneau “Rechercher/Remplacer”, onglet “GREP”. Je vous invite à lire cet indispensable Short cut. For the record, \1 is pretty well documented. It’s part of standard GREP implementations, see e.g. Friedl’s “Mastering Regular Expressions” (O’Reilly 2006) and http://www.regular-expressions.info/brackets.html. In the context of InDesign it was documented in http://oreilly.com/catalog/9780596517069/index.html. That title (from 2007) alse has an example that shows how to remove duplicate lines (p. 27). Thanks for the contribution. Also for the record, when I say “undocumented,” I always mean undocumented by Adobe (not in the help files or the User Guide). Their metacharacter table in the online and PDF help make no mention of support for these established GREP conventions, along with a few other important, but missing, gems like the “end of story” metacharacter (\Z), among others. I’m excited to have stumbled across your blog/podcast in a search for information about GREP and its functions. Been reading furiously trying to solve a find/replace problem I’m having. Perhaps this has already been addressed, but I cannot seem to find a reference! I need to reformat text direct from a copyeditor (who used Word); they’ve used characters instead of formatting (i.e., Name: to indicate the word “Name:” should be italicized). 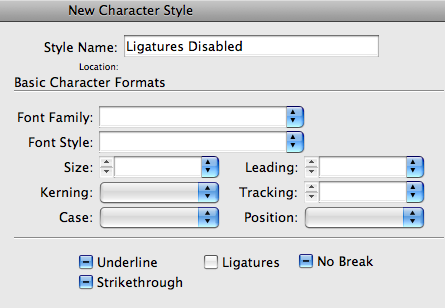 I can’t seem to figure out how to tell InDesign to find text within the character designations and . Once that’s figured out, I just need to replace with the appropriate format. There is probably a pretty simple solution; my understand of GREP just hasn’t stretched this far yet! I’d appreciate any guidance! hmm… the comment I just posted erased the formatting to which I was referring. That’s part of the problem, I guess. It wants to be read as a code and I want it to be searched for as characters! Perhaps this works? The characters (phrases?} are “” and “” without the spaces in between. In between those two phrases is a word that needs to be formatted. Eek. Sorry about the confusion. GREP can, indeed make short work of this task. However, I am literally writing the last few pages of the very last chapter of my book (which, by the way, includes a lot of great GREP info) and must plow through ’til it’s done. I will post a response for you once that’s off my plate. I really appreciate the information provided on the site. I found a solution to my problems regarding the GREP. Thanks for contributing in my work. Note: This finds the quotes but leaves them out since it only changes to found group 2; not 1 and 3. Very complicated, why not use posive lookahead/behind? That would be my recommendation, too. What that translates to is “any one or more characters (shortest match), only if it’s preceded by “Name: and only if it’s followed by a quotation mark. Hope that helps. If I’ve misinterpreted the particulars of how it’s sent to you, let me know and we can hammer out a bullet-proof solution together. In my examples I didn’t want to delete any text (like “Name:”), just format part of it, so I left the Change field empty. But of course if you want to remove the label as well, then you’d use the $2 (etc.) method in the Change field. Not sure this is possible, but it would save me a looot of work if so. Got a table with phonenumbers all stuck together. 8 digits, no space. Is it possible to divide these numbers in to 3 sections using GREP? Norwegian mobilenumbers are all divided in to 3 2 3, while stationary phones are 2 by 2 (all of them 8 digits). Do I make a fool out of my self hoping GREP could fix this? Really hope for some good answers to this one… I absolutely hate going down this looooong list of numbers dividing them with space each every one!!! Love your page!!! Extremely useful…. Anita — This is an easy one, depending on the answer to this question: how do you know which numbers are mobile and which are not if they’re all 8 digits with no spaces at the moment? GREP can easily find and change phone numbers for you, but if you need to treat some differently than others it’s slightly more involved. I have been using InDesign since it came out, and have great results. I have tons of copy, regularly, with a number of different ligatures in it. One (of the many, the fi ligature) causes the client to cringe. Is it possible to change this ligature by – turning off – the fi ligature only? Because I am out of the old school, I appreciate ligatures, and tight kerning. I realize, I could just turn off ligatures, but, would rather not. You don’t need a script to do this. There’s a good way to do it in CS3 (with GREP Find/Change) and a better way to do it in CS4 (with a GREP Style). Whichever version you’re using, the beginning of the process is the same. Make a character style that has everything else about it shut off or undefined (in other words, every field for Font, Style, Size, etc. should be blank, all checkboxes left in the “neutral” state, and all pull-down menus set to Ignore (or completely blank). The only thing that should be assigned to this character style is that Ligatures should be specifically shut off (as shown below). In CS3, you can turn off the ligatures using this style with Find/Change, and it can be a Text-based Find/Change. There’s no GREP required for this in CS3. Simply do a case-sensitive search for the letters “fi” together. Leave the Change to field blank and from the Change Format settings, choose the character style created above to be applied to all instances of “fi” in your document (or story, or selection, or whatever range suits your needs). Find the first instance, then click Change All. That will apply the character style that disables ligatures to all instances of a lower-case “fi” pair in your text. You’ll need to run this Find/Change operation whenever the document’s text is changed, just to be sure that new “fi” pairs haven’t been added to the text that don’t have this character style applied. The same would be true if you created a script to do this, as scripts need to be run each time you want to take advantage of their functionality. Find/Change is not necessary in CS4. Instead, create a new GREP Style within the paragraph style (or styles) where you want the “fi” ligature turned off. In the GREP Style options, select the character style created in the first step, and put “fi” (without the quotes) in the “To Text” field. The GREP Style eliminates the need to do multiple Find/Change operations, as it continuously scans the paragraph for “fi” combinations and automatically applies the character style to every one it finds. There are no spaces inbetween the numbers. I’m lazy, therefore I love GREP! This is a very easy one. You’ve got a pattern of 8 digita per line and you want to divide that into four sets of two digits each. The parentheses around each of the two “any digit” metacharacters marks them as a sub-pattern to be remembered so you can refer back to it in the change part of the query. They’re just two different ways of doing the same thing. In the Change to field, you recall those four sub-patterns with Found Text metacharacters, referring to each of the four sub-patterns numerically, in the order in which they appear (1st, 2nd, 3rd and 4th, in this instance). In between each, you add a space (or two spaces, or however much you need). That puts back each pair of unique numbers found with space between each pair. Heeey! Thanks and thanks again!!!! You just saved my customer an hour of spacing!!! This is probably dead easy… But I cant seem to figure it out. Please help me once again! If you want to find any text within US quotation marks and change it to your Norwegian marks, you need to specify the quotation mark characters without using the options available under the Quotation marks sub-menu of the special characters flyout menu. The options there don’t distinguish between the two. That translates as “an opening left double quotation mark, followed by any character, one or more times (shortest match), followed by a closing right double quotation mark. The part of the expression that describes the text within those quotes is enclosed in a marking subexpression (within parentheses), so it can be put back later. That puts back the text that was within the quotation marks, but surrounds them instead with the proper double-angle quotation marks, left and right. I tested this on my end and it works fine. Let me know if it solves your specific challenge. “Cannot find match.” it says! Per ”Elvis” Granberg (1941-1980) startet sin artistkarriere i musikalen ”South Pacific” i 1954. Hans rockekarriere skjøt for alvor fart i 1958 og han var aktiv fram til 60-tallet. And it can’t seem to find it… The text is copied from Word. Per «Elvis» Granberg (1941-1980) startet sin artistkarriere i musikalen «South Pacific» i 1954. Hans rockekarriere skjøt for alvor fart i 1958 og han var aktiv fram til 60-tallet. As you can see, its a s***te job when the customers hit a quotation mark high! I have to change the dictionary to Norwegian: Bokmål, then the double quotes into «»…Then start the prosess using Find/Grep to change them all in to the left side «, and once more to change every other (right side ») using Find next -> Change -> Find next… Not funny at all…! BUT it cant change it to the ones I want. Now, I’m working on a volleyball yearbook and I am facing a very challenging formatting problem. I am looking for something a little different. I have a list that looks like this. How do I remove the repeated CATEGORY NAMES after the first initial one? I believe this is do-able. I’m working out the kinks of an expression that gets me partly there, but is omitting the entries between the first and last instances of the category. I think I can work that out. Will post here as soon as I figure out how. Thanks, this would be a big help since I believe you can do anything with the right grep that you can do with a similar plug in like IN-DATA. IN-DATA seems to be an overkill for a lot of simple things GREP can do and with the FINDBYLIST script, you can generate everything in one shot. GREP and Find and Change has come a long way.